Join us to bear witness to a once-in-a-lifetime first, executed by NSS Labs and the remarkable advantages Fortinet has been bringing to the market, as the only vendor with security capabilities to receive SD-WAN "Recommended" rating. Discover how intent-based segmentation can transform your network from a reactive to a proactive security posture. Join our Fortinet technical experts as they discuss the in-depth why and how intent-based segmentation is vital to your overall network architecture plus real-world use cases including how to seamlessly meet complex compliance requirements such as HIPAA and PCI. The latest release of the Fortinet Quarterly Threat Landscape Report reveals the most intriguing threat trends uncovered by our dedicated research team, FortiGuard Labs. Join this webinar to gain an in-depth look at which threat trends to keep a watchful eye for, as seen through the lens of our security strategy expert, plus a stronger understanding about how to protect your network against new exploits that target IoT, top malware attacks, unrelenting botnets and much more. Join the discussion and learn about the full advantages of implementing an SD-WAN solution that enables both digital transformation and comes with critical cybersecurity. 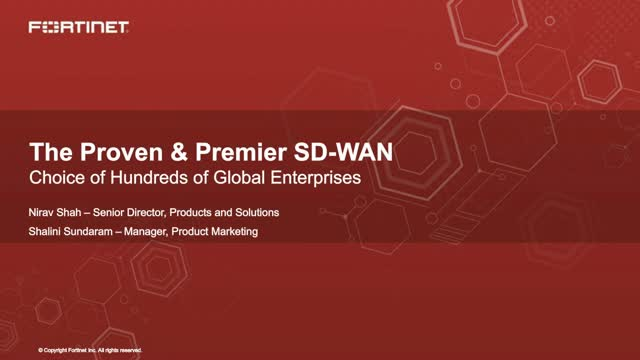 Our Fortinet experts will guide you through a variety of use cases including how creating an SD-Branch can extend SD-WAN capabilities to enterprise branches, plus key insights about what your peers are weighing in on about the current landscape of SD-WAN solutions. Learn how to leverage your existing security investments and Fortinet API's to automate security in your multi-vendor environments spanning the cloud, IoT, data center, and mobile plus additional insights into specific partner-developed integration solutions. Learn how Fortinet's multiple years of AI and machine learning (ML) capabilities are key to combating and preventing evolving attacks. Processing more than 100 billion security events each day, our expert will review Fortinet's unique understanding of the threat landscape allowing its AI solutions to quickly learn and adapt to new and evolving threats, and why AI and ML is key to safeguarding your organization's security posture well into the future. Fortinet was named a Challenger in the first Gartner Magic Quadrant for WAN Edge Infrastructure. Join our expert to learn about insights from the report and how Fortinet SD-WAN weaves both networking and security, providing one offering that is scalable, reliable, and secure; setting us apart from the competition. Plus, learn more about the recently released Gartner Magic Quadrant for Unified Threat Management (SMB Multifunction Firewalls) report, which named Fortinet a Leader for the ninth time. Watch this panel discussion filmed at the Tech Museum of Innovation in San Jose, where Fortinet’s SVP of Products and Solutions interviews key executives of the recent Bradford Networks acquisition, as well as a partner exec, to discuss how and why network access control is a critical solution to gain visibility into the known and unknown “things” accessing your network. David Cahoon - VP of Client Services, Network Computing Architects, Inc.
A recent threat landscape assessment reports a double-digit growth of cryptojacking. Organizations will soon be facing a phenomenon similar to ransomware if their security posture is not ready to address this new issue. Join our panel of experts for a round table discussion around these types of threats and the tactics cybercriminals are leveraging today plus learn about how Fortinet’s advanced threat protection (ATP) Fabric-enabled approach stops the delivery of malicious crypto-mining malware across the dynamic attack surface targeting end-users and servers from the campus to the cloud. Join us to hear from two security leaders, and their interpretation of the takeaways taken from the findings of a new global survey of 300 enterprise CISOs on topics such as security traits and best practices of top-tier security organizations and much more. Join our FortiGuard Labs expert to learn more about the unique vulnerabilities in the healthcare sector that make it a desired target for hackers, plus some of the surprising reasons of why attacks have skyrocketed in healthcare more than any other vertical. Keith has a 21 years military background, including USAF nuclear weapons and USA FC/test pilot, threat officer and various leadership roles. He also has 20 years in security management and consulting at placing including NASA JPL, World Bank, CME, Delta Air Lines, Humana, HECO, Hona NA, USAA, and Corning among others. Join our industry experts as they examine the rigorous testing performed by NSS Labs for NGFWs, where Fortinet placed and why performance and security is important when it comes to SSL inspection. The security challenges facing organizations today can't be solved with traditional approaches. Digital transformation is creating an unending digital attack surface, point solutions are creating unprecedented complexity, and threats are constantly becoming more sophisticated. Watch our webinar to learn how FortiOS, the most deployed network security operating system in the world, solves today's security challenges with broad coverage, massive integrations, and time-saving automation. Specifically, learn the details on revolutionary new features that deliver better protection in all areas of the network. These and other trending vulnerabilities from our Quarterly Threat Report. Cyber threats are as unpredictable as the weather, which can make preparing and planning for them daunting and full of uncertainty. Join our fourth installment of in-depth threat research where our security strategy expert walks you through the top trends, such as IoT botnets targeting System-on-Chip (SoC) devices, fileless malware and -cha-ching! - the mining of digital currency. Learn how to address always-evolving cyber threats, the ubiquity of encrypted traffic, and the shortage of security professionals with a smaller, but mightier edge firewall.